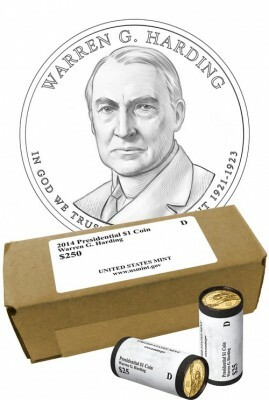 The week of February 3rd through the 7th of 2014 finds only products relating to the Warren G. Harding Presidential $1 Coin scheduled for release. Of course, despite the limited focus of the release, there are actually six different products to be issued. All six feature a portrait of Harding on the obverse and will become available on February 6, 2014 at Noon (Eastern). As can be seen from the above list, the new releases include rolls, bags and boxes of the Warren G. Harding Presidential $1 Coin struck at either the US Mint's facility in Philadelphia or the US Mint's facility in Denver. All are struck to circulation quality. However, none of these coins have actually been released into circulation. "The obverse (heads side) of the Warren G. Harding Presidential $1 Coin is by United States Mint Associate Designer Michael Guardioso," describes a release from the United StatesMint. "The design features President Harding's portrait and the inscriptions WARREN G. HARDING, IN GOD WE TRUST, 29th PRESIDENT, and 1921 - 1923. The coin's reverse (tails side) is by United States Mint Sculptor-Engraver Don Everhart and features a rendition of the Statue of Liberty and the inscriptions UNITED STATES OF AMERICA and $1. The inscriptions 2014, E PLURIBUS UNUM, and the mint of origin are incused on the coin's edge." The reverse design is the same as used on all coins of the Presidential $1 Coin Program. These coins are offered as the first 2014-dated release of the program. Future issues will honor Calving Coolidge, Herbert Hoover, and Franklin D. Roosevelt. Pricing of the individual rolls is $32.95. The 100-coin bags will be sold for $111.95 with the 250-coin boxes offered for $275.95. When released, all may be ordered directly from the United States Mint via the website of www.usmint.gov or by calling (800) USA MINT (872-6468).